The Mehmed Paša Sokolovic Bridge in Višegrad is one of the best remaining examples of Ottoman architecture and civil engineering. It is almost 180m long and has 11 arches. It spans the Drina River in the Republic of Srpska. The bridge was built at the end of the 16th century by the Ottoman court architect Sinan. He was one of the greatest architects and engineers of the classical Ottoman period and a contemporary of the Italian Renaissance, with which his work can be compared. The Grand Vizier Mehmed Paša Sokolovic, who was born in this area, ordered the construction. This seldom visited WHS lies hidden in the far east corner of Bosnia Herzegovina. I visited it on a day trip from Sarajevo: 3 hours to get there, 75 minutes in Visegrad, and then 3 hours in the bus back. It's a sacrifice one sometimes has to make in pursuit of visiting as many WHS as possible. The fun thing was: I wasn't the only one who had chosen to spent the day like this. An elder Japanese couple did exactly the same outing, just for taking some pictures of the bridge and then turn back to Sarajevo. The bridge is closed to traffic nowadays, but pedestrians can cross. A large group of local youth was singing and drinking beer near the mihrab at the center of the bridge - a celebration of the end of the school year I believe. Otherwise it is just used as a shortcut between Visegrad city and the houses on the other side of the river. There's a new bridge 1km upstream where motorized traffic is directed to. I wasn't really perplexed by the bridge at first sight. It's a rather sober construction, obviously a grand piece of work in its time but a bit underwhelming in 2013. Due to human impact, the water level has risen over the years so the bridge looks different now then when Sinan designed it. The pillars almost aren't visible anymore. Getting to Visegrad means that you enter the Republika Srpska, the autonomous part of Bosnia Herzegovina edged out for the Bosnian Serbs in the Dayton Agreement. For me it felt like I was back in Serbia, mainly due to its Cyrillic signage. P.S. 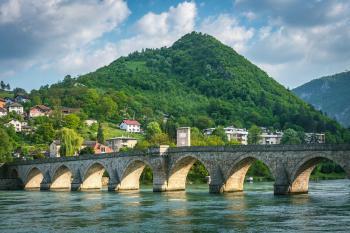 : According to the Visegrad Tourism website, reconstruction of the bridge has started in April 2013. It will last more than 2 years, and the bridge will be closed off for pedestrians too, starting in Summer 2013. I did not see any reconstruction activity going on when I visited on May 16th, so maybe there's a delay. I visited the site in April 2016. It is not difficult to get to. If you have a car it is about a 2-hour drive from Sarajevo. Once you arrive in Višegrad, it is pretty hard to miss, as the river is the dominant feature going through the town. The bridge is currently only open to foot or bicycle traffic and it is visible from the modern bridge which is used by cars. There is a small parking area available off the road which is connected to the bridge by a walking path. Read more about the Mehmed Paša Sokolovic Bridge in Višegrad on my website. There's only one bus a day from Lukavica bus station, East Sarajevo, to Visegrad, at 3pm. All other buses (at least 5, the first one at 07:30 am) were moved to the new bus station in Pale, 16 km east of city center; the only way to get there from Bascarsija is by taxi, as there are no any public connections between Sarajevo and Serbian East Sarajevo. In Visegrad all buses stop by the bridge. There's no bus station in the city so if you're heading out of the city, just wait at the NW edge of the bridge. Half an hour is good enough to admire this WHS from all the angles, climbing the nearest rock included. No much to see in Visegrad apart the Sokolovic Bridge: Ivo Andric's house (closed to the public) and Andricgrad, a new tourist place with nothing interesting in. The bus journey from Sarajevo to Visegrad is slow but scenic. About half of the 3 hours was spent on smoko stops. But reaching the Lukavica bus station requires an hour's journey by a #103 trolleybus from downtown Sarajevo to Dobinja, then walking across the invisible border to the Republica Srpska bus station. But by starting out early I managed the return journey in a day. There are only three bridges on the UNESCO list so far, so I think this is a special monument to se. Behind it's architectual value it had a big influence on the culture of people in Bosnia and Herzegovina. The bridge is also famous thanks to the only Nobel prize winner from Ex Yugoslavia, Ivo Andric, who wrote a book about the bridge. At this moment I am preparing materials for the official web site of Tourist organization of Visegrad (www.visegradtourism.com), where the bridge is situated, and the text below is a part of that materials. I hope you will find it usefull, but if you want to find out more about Visegrad visit visegrad web site. 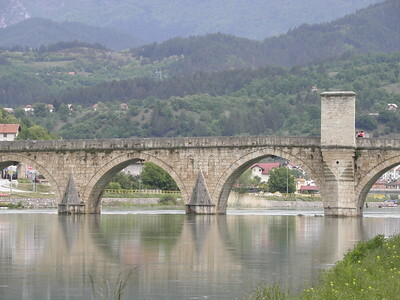 The Višegrad Bridge is a heritage of the great vizier Mehmed-pasha Sokoloviæa (in Turkish Sokollu Mehmet Paºa, 1505. or 1506-1579). He is one of the great Osmanli war generals by origin from Bosnia. He was born in the village of Sokoloviæi near Rudo in 1505. or 1506, and was a child of Orthodox parents. At that time there was a tradition known as Divširma, or „The contribution in blood”. Serbian children would be taken away by force to Turkey where they would be converted in Islam and taught in their military schools to become Janjièari, the elite soldiers of the Turkish Empire. So was Bajica Sokolovic taken as a child from the surroundings of Višegrad and given the name Mehmed. Later on he would become the great vizier of the Osmanli army for his skills, and on top of his rule became a great vizier, which equal to the Prime Minister according to the standards accepted today. At the highest peak of his rule, he orders to build the bridge on Drina at Višegrad that no other bridge looks alike. The bridge was built in the period from 1571 to 1577 by at that time the most famous Turkish architect Kodža Mimar Sinan. It was built in the eastern style and represents the master piece of that era. The bridge consists of 11 arches with mild ascend towards the middle section and the exit dock on the left coast. Above the arches in the whole length are wraths on top of the fence. The total length is 179, 5 m, the height with the regular river water level is 15, 40 m and the width is 6, 30 meters. The bridge was made of stone, tuff, or bigra, brought from Višegrad spa. There is extension at the sixth pillar on both sides. On the access dock at the left river bank are three arches made with broken arches. The sofa was put in the middle of the bridge foreseen to be used for resting for passengers, across of which the stone portal is placed. In the past there was a wooden house in the middle of the bridge with a buffer stop and a bridge guards, and that part of the bridge is therefore called The Gate. Here are two plates made of white marble with the lyrics of the writer called Nihadija in Arabic alphabet, that speak about the constructor and the year of construction. On top of the deep and noisy river. During its existence the bridge sustained many difficulties. The first recorded damage of the bridge was in the middle age when one of the arches collapsed. The bridge was repaired in 1873, but than in 1896 there was a big flood that wiped out most of Višegrad, but the bridge was almost intact, although Drina was deep 14,6 m. Only the stone made fence of the bridge was damaged. During 1914 the two pillars were knocked down and the arched that aligned on them, and during the 1943 four more pillars with arches were ruined as a consequence of mining. In between the two world wars the bridge was temporary enable to be in service by use of metal construction. Detailed reconstruction of the bridge was performed during the period from 1949 to 1952. 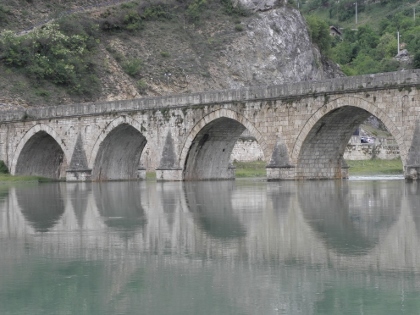 The bridge is one of the most important national monuments in the Bosnia and Herzegovina, and was in July 2007 inscribed in the UNESCO world heritage list. Mehmed Paša Sokolovic was a local lad made good who rose to become one of the most senior figures of his day in the Ottoman Empire. As this part of what is now Bosnia was something of an outpost, this is quite impressive - a bit like an Indian becoming prime minister in Victorian Britain. 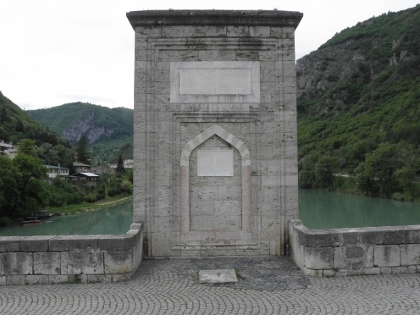 He sponsored the building of this bridge by one of the great architects of the time, and this Višegrad bridge is considered one of the finest examples of Ottoman bridge design, hence its inscription. I struggled to get more info than this about the bridge as the newly built tourist office was not geared up for non-slavic speakers. Set on the outskirts of what is now a sleepy little town - at one end is a nice cafe for relaxing in the shade of the trees by the river - it is a very pleasing-looking bridge, in pretty good repair (having been extensively reconstructed following floods etc.) but hard to recommend as a must-see unless you have a passion for Ottoman bridges. The valley it sits in is picturesque, and it makes for a good break if you're driving between Sarajevo and Belgrade. 76 Community Members have visited.